I was on a boys’ weekend in Whitby. You know, don’t you, that ‘boys’ in this context actually means ‘grown men’. In fact, it would be more accurate to say ‘mature men who should know better’. But we’ll settle with ‘boys’; it’s a comforting euphemism. It’s just occurred to me that ‘euphemism’ can be a euphemism for a downright lie. If you’re feeling really picky, it wasn’t a weekend, either; weekdays are cheaper and I managed to get time off for good behaviour. Anyway, there we were, six strapping lads of advancing years, as excited as a bunch of schoolgirls loose on a Saturday afternoon. We don’t get out much. Whitby’s a grand place. There are lots of interesting things to do, such as visit the Captain Cook Museum, find a pub, climb the 199 steps to the amazing church of St Mary’s at the top, nod to Caedmon’s Cross, and go on to see the remains of the equally amazing medieval abbey church, find a pub, take in the Dracula Experience, have fish and chips, buy an expensive piece of beautiful Whitby jet jewellery for the girl back home, find a pub. 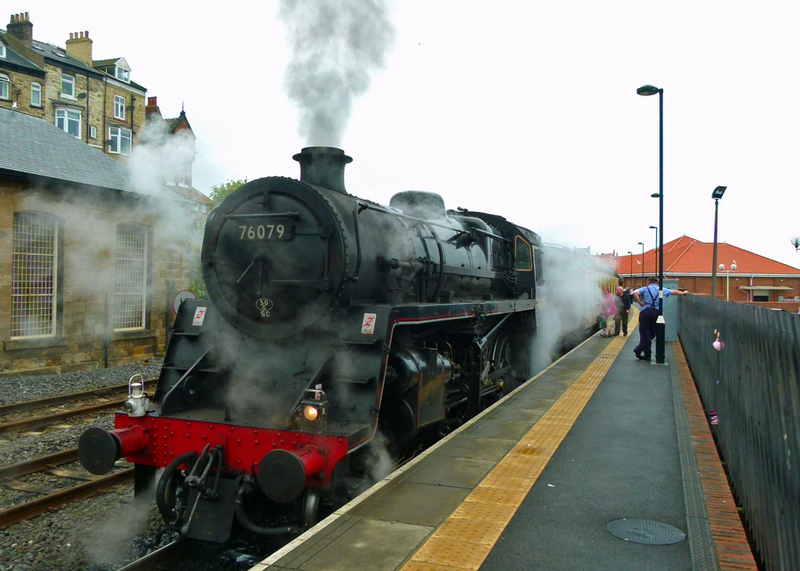 Or, you can take a trip on the North Yorkshire Moors Railway; which is exactly what we did – as well as some of the other stuff. The North York Moors Railway is a heritage railway, saved, nay, resurrected, by a bunch of enthusiastic volunteers in the late 1960s. From insignificant but determined beginnings, it now runs wonderful steam trains most of the year between Whitby and Pickering, 18 miles each way, through the heather, fields and woodland of the moors. In fact, the NYMR owns about a dozen steam and half a dozen diesel locomotives with a fulltime staff of about 100, supported by around 550 volunteers. Do you know how many heritage lines there are in Britain? About 200. That includes private railways (eg rich boys’ toys on estates) and covers all gauges: standard, narrow and miniature. Many of these are lines that Her Majesty’s Government in the 1960s, championed by a minister of the Crown who coincidentally owned a road-building company, decided that the public had no further use for. So now Britain has 200 unwanted railways, all somehow managing to survive; it’s a complete mystery. Moreover, most of them are hugely supported by enthusiastic volunteers. That’s astonishing, when you think about it. Imagine how many thousands of people heritage railways keep occupied, when they could be doing something socially productive – like quilting, caving, checking their mobiles, or riding a motorbike to somewhere and back again. It occurs to me, not for the first time, how lucky is the society that is able to indulge its citizens’ hobbies. 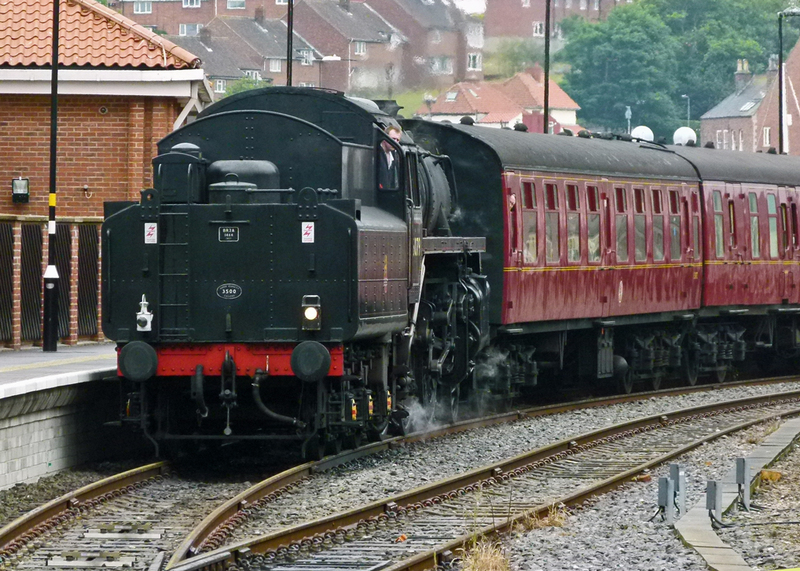 And how fortunate when one of them, like a love for trains and railways, resonates with the public; because many of these railways are incredibly popular visitor attractions; and the North York Moors Railway is one of them. We’d already decided not to go all the way. It’s always tempting, of course, but wise heads counselled against too much stimulation. 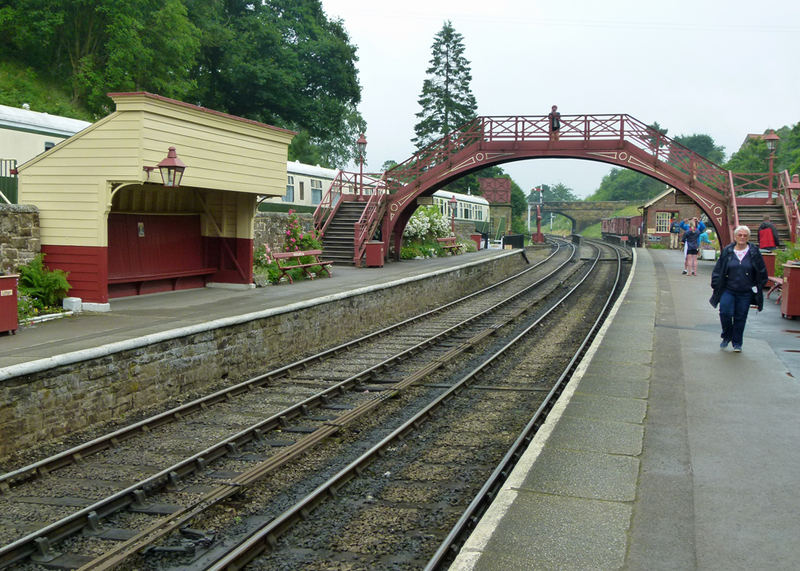 It is a journey of at least an hour and forty minutes from Whitby to Pickering, passing through the stations of Grosmont, Goathland, Newtondale and Levisham. 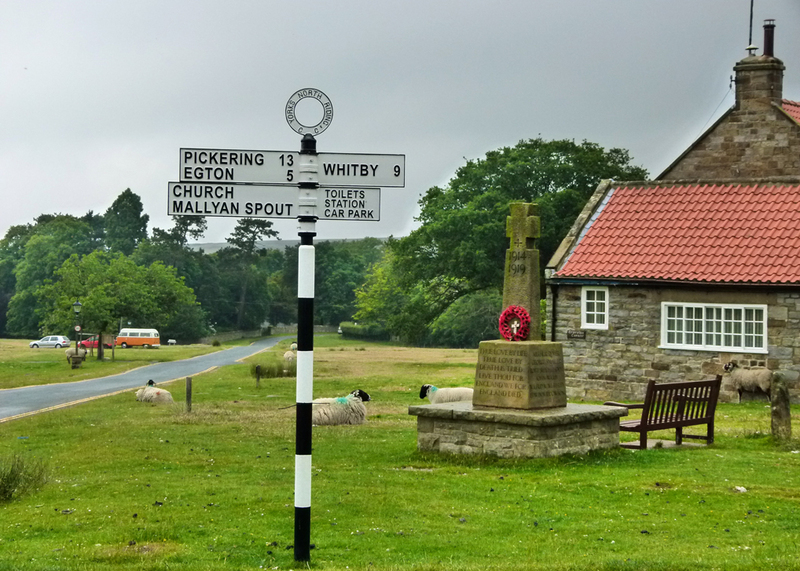 Each one would tempt us with its many delights (Newtondale, for example is a request stop for walkers), let alone the promise of the pleasures of Pickering at the end of it all. And then we’d need to travel back. The excitement would have been too much for many in our party. Besides, we’d have no time in Whitby, where I must confess that some of us had been introduced to a rather nice ale, Timothy Taylor’s Boltmaker. * Clearly, we had to return to be sure that this really was almost as good as Fuller’s London Pride. So we did a very British thing, and compromised. 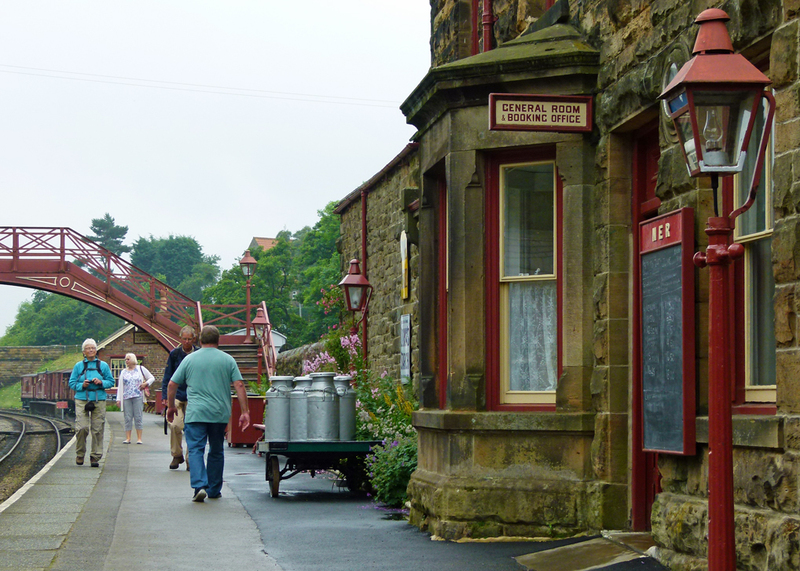 We bought return tickets to Goathland, a community with a rich history going back many centuries, but nonetheless apparently defined by being the fictitious village of Aidensfield in the TV series, Heartbeat. You can imagine the mounting tension as we queued among a throng of happy day-trippers, escaped care home residents, the generally bewildered and schoolchildren with no volume control. We chewed on locally caught pies to stay calm. The train, when it arrived, was being pulled by a locomotive running backwards. It was then uncoupled and neatly manoeuvred to the front for our journey. It all looked absolutely splendid. However, I don’t know about you, but once you’re on a train it doesn’t really make much difference what’s pulling it, does it? While it’s very agreeable to picture this huge, gleaming, machine, its pistons pumping, billowing smoke as it rackets through the countryside, penetrating tunnels, tugging its classic carriages and us along in its wake; you can’t actually see it. Your direct experience is limited to the pang of nostalgia prompted by being seated in a wagon of yesteryear, and looking out at the countryside – which I should say, of course, was jolly pleasant. It was at this point that one of my companions made the mistake of being friendly and talking to the couple seated opposite. For the benefit of my alien reader, it should be clear that the British – well, certainly the English – are not traditionally renowned for making casual chit-chat with strangers on trains; it is an unnecessary intrusion of personal space and there’s no telling where it will end up. I don’t know what my friend was thinking of, particularly as the male member of the duo had the unmistakeable air of an enthusiast. And so it proved. We learned that the North York Moors Railway has converted several old railway carriages into natty little static holiday homes, similar to World War II pre-fabs, which he and Mrs Loco had hired. Included in the deal is the reward of being able to ride up and down on the North York Moors Railway to your heart’s content for the duration of your stay. Imagine that; we could barely contain ourselves. Thus the journey to Goathland was even longer than we had anticipated and I regret that our grandiose display of reluctance to get off might have been interpreted as being somewhat less than sincere. Goathland has at least two other claims to fame. For a brief time in the 19th century it was, apparently, a spa. For a probably slightly longer period in 2001, its attractive railway station starred as Hogsmeade Station in the film Harry Potter and the Philosopher’s Stone. If you really must know, it’s the bit where Harry and Ron are met by Hagrid before being floated off to their first term at Hogwarts. Goathland being 500 feet above sea level, it’s an uphill walk from the station to the village itself and the first thing you see when you get there is the Goathland Hotel, which was the Aidensfield Arms in Heartbeat. Directly opposite is Scripps’ Garage, which I gather also featured in the series. Currently, it is a gift shop specialising in things you didn’t know you needed. There is then a walk of at least 50 yards to the village centre. Our team had a good 40 minutes to sample the delights of Goathland before our personal steaming iron chariot arrived to return us to Whitby. Spoilt for choice, my colleagues instinctively worked out that the proper thing to do was to concentrate on just one cultural attraction, but do it well. So they went to the pub, disappearing inside as swiftly as rabbits down a burrow. 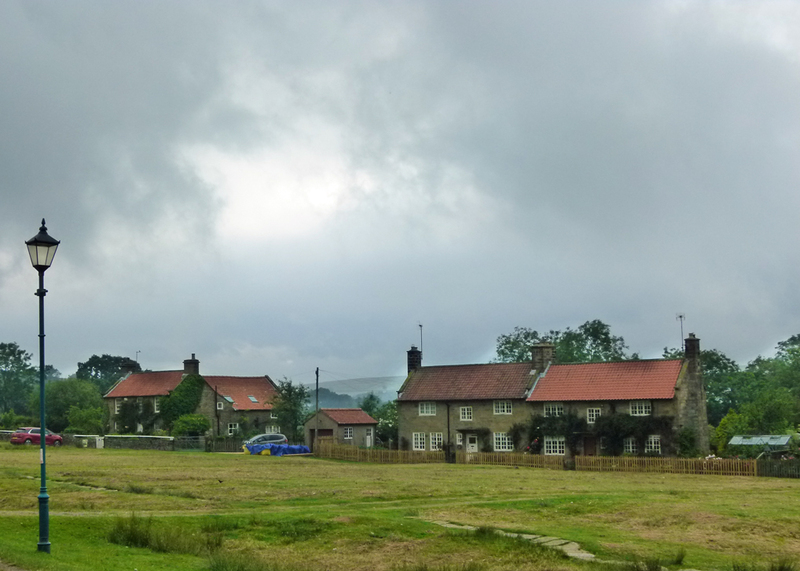 However, knowing that you, dear reader, would expect to see some pictures of Goathland-Aidensfield, I trekked at no small personal inconvenience into the heady bustle of the place. Perhaps I should explain, for the benefit of those who are not familiar with the TV series (including myself) that Heartbeat was a light police drama based in 1960s Yorkshire. It ran from 1992 to 2010 and can still be spotted, lurking on obscure channels, if you’re not careful. Its initial star was someone called Nick Berry, who recorded a cover of the Buddy Holly number, Heartbeat. I gather that the best thing about the series was its great 60s music and a character called Gina; or maybe it was the other way round. Anyway, despite it looking a little tatty, I liked Goathland very much. There was, indeed, a 1960s Ford Anglia police car. And there were lots of contended-looking people passing in and out of ‘Aidensfield Stores’ and other exotic emporia, such as the post office. Sheep, not given to pondering their future, grazed on the green without a care in the world; a peaceful, bucolic, scene. The surrounding countryside looked fabulous. Alas, there was no opportunity to explore nearby Mallyan Spout, a 70 foot waterfall, or Wade’s Causeway, a trackway that is probably Roman, but may be newer, or perhaps older. 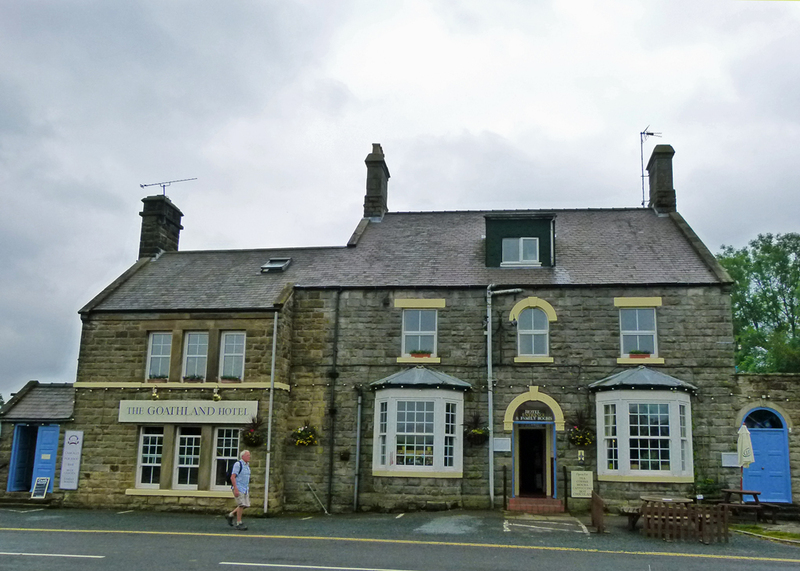 Rejoining my comrades, there was just enough time to glug down most of a pint of Abbot’s in the Goathland Hotel before returning to the station. We made it with seconds to spare, to find the platform alive with charming, smiling, visitors from East Asia taking iPhone photographs of sleepers, heaps of coal, other rare railway features – and each other. Despite our promptness, the Whitby service was late, but our return passage on the North York Moors Railway was soothed by the curiously soporific banter of yet another enthusiast (honestly, the place was full of them), as well as the prospect of shortly finding some more Boltmaker. And we hadn’t even told our parents when to expect us home. Resisting the temptation to tell you about Sally, who looked like Popeye, I will leave you with the option of listening to the original 1958 version of Heartbeat, by the late great Buddy Holly. I’m afraid I think this is infinitely better than the Nick Berry cover. Moreover, it’s the only song I can think of that contains the unforgettable lyric, piddle-dee-pat – always worth hearing, when you get the chance. *A Bit About Britain is not responsible for external websites but apologises for the images on this one. Oh, that was a fun post to read! We also have an old steam train not far from Cottage. I took the ride a while ago and enjoyed it, but it was pre-blogging… So I guess I need to schedule it again! What a delightful day out! Thanks for bringing us along. Steam engines were a theme of our trip to England, but we ended up skipping the opportunity to ride a steam train for precisely the reason you mentioned — you don’t really get to see it at work. We spent a lot of time in museums and an amazing day at Crofton Pumping Station. Now that is one of the most interesting and fun posts you’ve written (perhaps because we’re Heartbeat fans – yes we get it here in the colonies, on the obscure channels we might watch as we search for something worth watching). 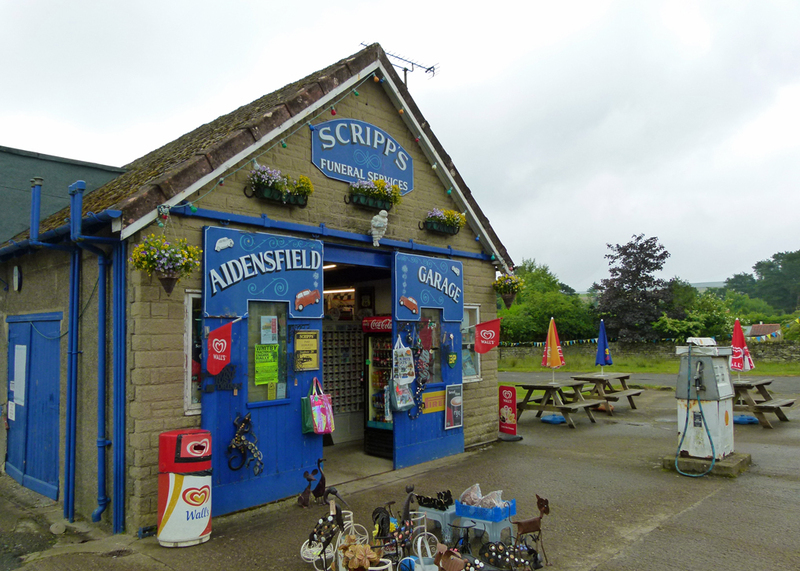 So I loved the photos of the Aidensfield Arms and Scripps Garage. Trains are something special too, and we’ve saved precious few of them here, only a few main lines near cities. All through rural Ontario there are old rail lines now trails for ATVs and anyone else who dares get in their way. I wish we’d saved more of the glory of the old railway era. Volunteers make such a huge difference! I had a real giggle reading this fantastic post, Mike! 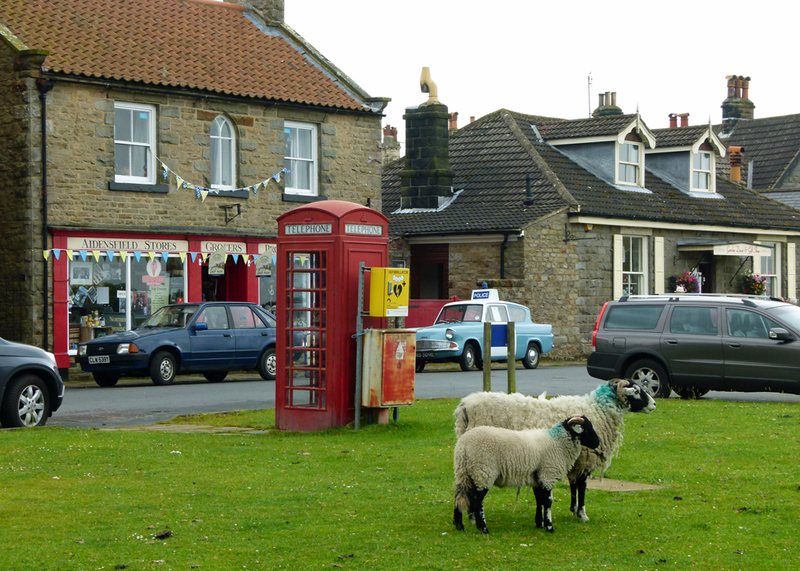 The photos are good – I love the one of the phone box and sheep on the green. I travelled on the NYMR in 1997 so I think I’m due for another! 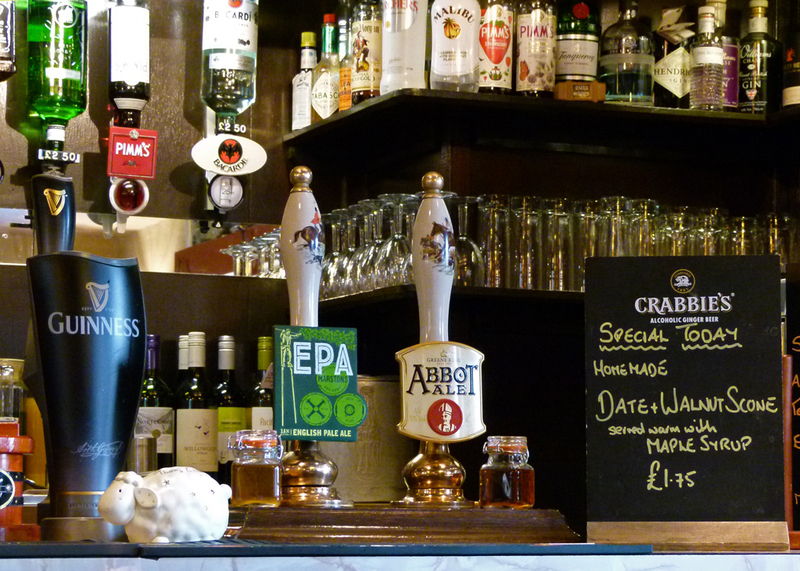 This was quite a romp: steam train, iconic train station, and of course, historical pub! You can’t possibly top this itinerary. 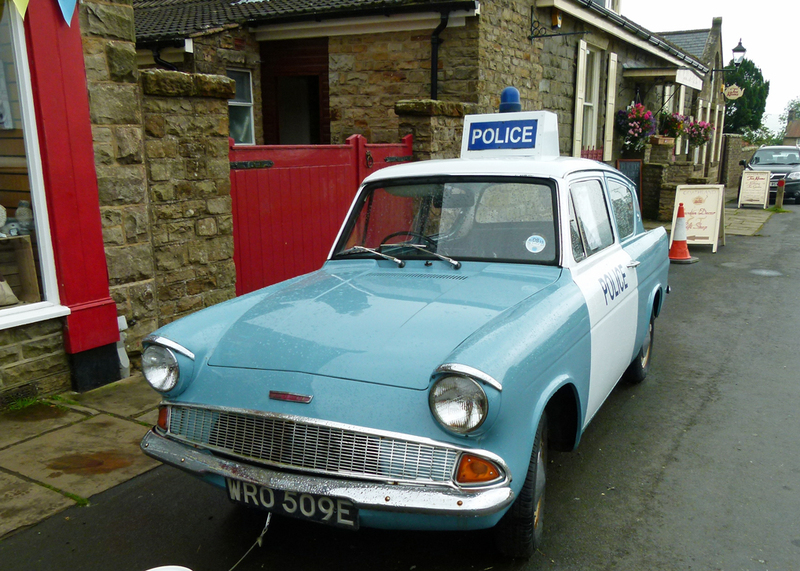 Loved the Ford Anglia police car. That was amazing. Hi Mike, super time and must have been very enjoyable spent with friends. Couldn’t think of a nicer way to end up at the pub for a nice refreshing pint. Miss those pubs! The ambiance in a several hundred years’ old building is like no other. Thanks for a great tour. Fabulous photos they have brought back happy memories of several holidays in the area (my ancestors are from the Whitby area). The most recent holiday was when we had a family holiday in a large house situated in Goathland. I have tried to find a link for you but I have not been successful yet! Buddy Holly. Love it. And loved your journey. I rather think that if you guys had more time you might have got into a lot of trouble — fun trouble! Sounds like a jolly bunch and I confess to being torn as to whether I’d like to sight see or pub sip! Glad you had a little time to do both! Great post about an area I know well. Being married to a Yorkshireman for 47 years has involved is spending quite a lot of time in that country. Your commentary gave me a giggle and the image of a group of naughty little boys was superb. Whitby is a lovely place to spend a few hours – or, in your case, perhaps, down a pint or two of Boltmaker. I remember Heartbeat well, too. I believe Nick Berry was in Eastenders before he moved up in the world and headed off to Goathland. Thanks for the nice trip down Memory Lane. Brought back some great memories. 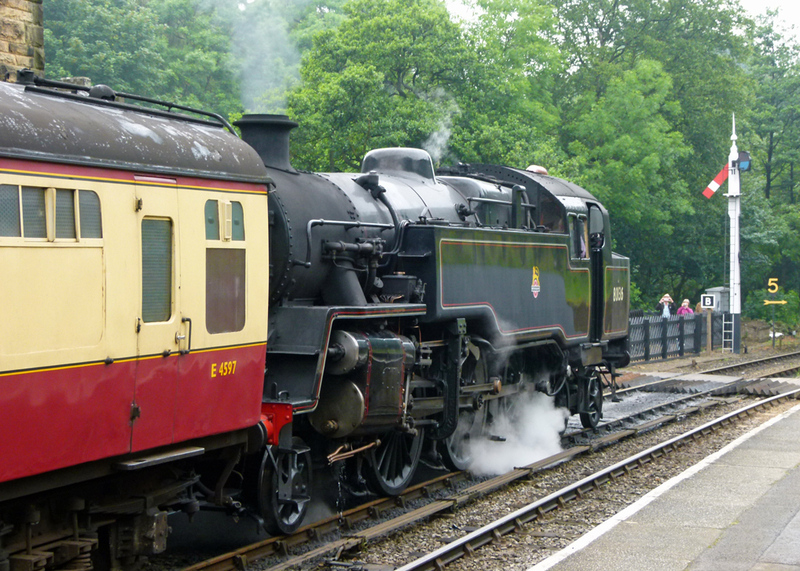 We did the NYMR in 2010 and had a great time. We just did a sleeper train over here in the USA from Chicago to Whitefish Montans. I remember you saying you stayed in Staithes – just up the road from Whitby? Yea, Staithes, and we loved it. real quiet, not touristy at all. Your train photos remind me of Thomas the Tank books that my son loved so much as a child. You do wonder what Holly would have achieved if he’d lived. The Beatles did a good cover of his ‘Words of Love’ on ‘Beatles for Sale’. I’m sure I’ve seen a full-size Thomas somewhere – maybe it was a dream! A place I’ve always fancied going. Seen bits of most of the TV programmes and HP film you mentioned and the Dracula film completed there was atmospheric with the surrounding coastline draped in fog. Used to enjoy the occasional team handed boy’s outing here and there in classic ‘rat pack’ mode for a night out but with advancing old age and other commitments it happens less often now. To say I love steam engines would be an understatement. But Dracula and a steam train would be wonderful!!! I have to thank you for your huge and selfless sacrifice of letting the other “boys” investigate the glories of a Boltmaker or two, while you brought us the delightful images of Goathland. Yes, I have seen Heartbeat. It’s on the telly here every Friday night, taking me back to my teenage years in the 1960s. Is that a panda car? And didn’t Nick Berry used to be in Eastenders many decades ago? I used to travel regularly on one of those noisy smelly lovely steam trains from my home in North Devon to boarding school in South Devon. Ilfracombe to Barnstaple, change at Exeter St Davids then to Totnes. Almost forgot…. just down the road from where I live in Ontario is the town of Whitby, not far from Pickering, and just a little way from Scarborough. That’s amazing; so all the early settlers were from Yorkshire then?! I’m not sure exactly what qualifies as a panda car, but believe it’s any small police car. In the 80s/90s, police cars used to have big red/yellow fluourescent stripes along the sides; we used to call them ‘jam sandwiches’. Yes Nick Berry was in East Enders – another show I have conveniently missed. Totnes? Lovely town! PS. I can remember an episode of Heartbeat where the plucky bobbies were hunting for a miscreant in Whitby and had parked up their Panda by the swing bridge. If they’d only looked up from their dialogue they’d have spotted him in the doorway of Woolworth’s having a crafty fag. It was only across the road! I saw that in the pub, as I was being hurried out. I’ve seen similar dances elsewhere – they’re amazing. Wonderful places to visit. I wouldn’t mind living there. It’s amazing what volunteering can do. Thanks, Helen. Seriously, I reckon the UK would fall apart without volunteers! Pleased you had a fantastic visit. Love the photos … and I appreciate the inside info on the British as well. 😉 I know better when this American boards the train, LOL! It’s been at least 10 years since my last visit to Whitby, but it is definitely a place I want to go to again. Not this year, though; not enough time – we are already half way through our annual Yorkshire Holiday, and have planned meetings and visits with friends and family most days. I know the NYMR from sight but have not actually been on it; also, it is likely I never will be, as I agree with you that it hardly matters what pulls you once you are on a train – and I am on trains almost every day for either work or seeing my boyfriend (who turned 50 this May). The difference between men and boys is the price of their toys. Something about trains brings out that impulse in guys! It’s the oddity of the sheep near the phone box that really catches my eye. Terrific shots, Mike! You remind me of my 93 year old neighbour who talks about her 89 year old boyfriend – I don’t know what else she could call him but boyfriend sounds both quaint and in appropriate. 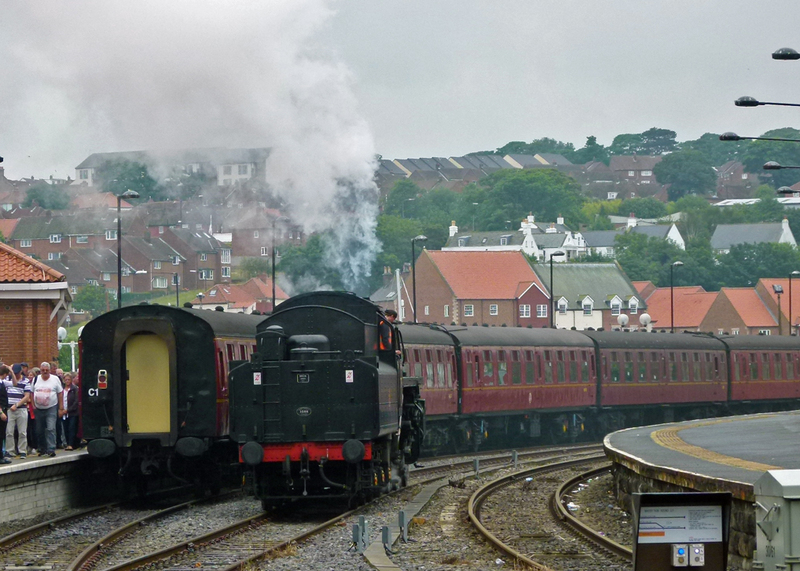 A boys’ weekend in Whitby, be it weekdays or not, is a grand place to visit, and even better when you can catch a steam train and visit the delights of Pickering. My favourite thing to see in Pickering is the wonderful Doom Wall Painting in St. Peter’s and St. Paul’s. It is well worth a visit if you haven’t seen it.